엔토 매니저님! 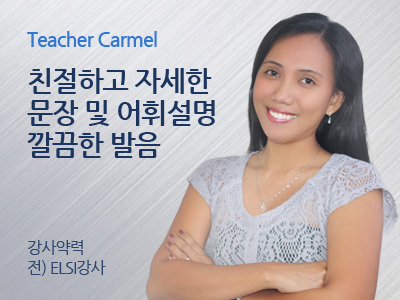 Carmel 선생님은 어떤 분이신가요? 꼼꼼한 커렉션과 열정적인 수업으로 학생들의 많은 사랑을 받았던 Carmel 선생님이 다시 엔토영어로 돌아오셨습니다. 꼼꼼한 학생관리와 친근한 대화 분위기 2마리 토끼를 모두 잡고 싶다면 Carmel 선생님의 수업을 꼭 신청하세요! Hello English enthusiasts, this is Teacher Carmel of Entor. 영어 마니아님들 안녕하세요, 저는 엔토영어의 카멜 선생님 입니다. 저는 30살이고 필리핀 딜리만 대학에서 호텔, 레스토랑, 연구소 관리를 전공했습니다. I usually read books, surf the internet or watch TV. 제 취미는 독서, 인터넷 서핑, TV시청 등 입니다. I love staying at home to relax but I also enjoy going out with my friends for some chat. 저는 집에서 시체놀이 할 때가 제일 좋지만 친구들과 만나 수다떨기도 즐긴답니다. Though I am not a teacher by profession, I have been teaching English to Koreans online for 6 years. 제가 교육 전공자는 아니지만 한국인들에게 영어를 가르친 지 6년이 되었습니다. I find this job fulfilling not only since I am able to impart my knowledge to my students but also because I learn some things from them as well. 이 직업을 통해 제 지식을 학생들에게 나누어주는 것 뿐 아니라 저 또한 그들에게 많이 배울 수 있다는 것에 굉장히 만족합니다. I strongly believe that learning is a two-way process and I strictly observe that in all my classes. 배움에 있어서는 어느 한쪽 방향이 아니라 쌍방향이라고 확신하며, 제 모든 수업에서 이를 확인해 왔습니다. Here in ENTOR, we, as much as possible, try to come up with the most suitable learning method for each of our students. 저를 비롯한 엔토영어의 모든 선생님들은 수강생 여러분들에게 최적의 교육 방법을 제공하도록 최선을 다하고 있습니다. We try to be flexible not only in dealing with them but also with the books and teaching style we apply to each and all our clients. 저희는 각각의 수강생에게 융통성 있는 교육 방법과 교재, 강의 스타일을 적용합니다. We prioritize learning but also consider whether we provide an enjoyable class atmosphere. 영어 공부를 최고의 우선순위에 두면서도 즐거운 수업 분위기를 만들려고 노력합니다. So check us out here in Entor. If you're looking for confidence, profiency and comfort, we can definitely assist you with that. 한번 엔토에 오셔서 확인해 보세요. 자신감, 실력, 편안함을 찾으신다면 저희가 바로 확실한 조력자가 되어 드리겠습니다.